Chapter Youth Council members show off their poster to promote understanding of International Humanitarian Law (IHL). Over the last 7 days, the Greater New York Red Cross provided emergency assistance to 151 adults and 47 children following 54 local disasters. Here are some highlights from last week and a preview of upcoming activities (see below). Red Cross volunteers recently gathered at Primrose Elementary School with first graders to build Stephanie Crispinelli Comfort kits that will be distributed to children effected by disasters. Yesterday, we posted this video of the event. Thank you to the Stephanie Crispinelli Humanitarian Fund and to all the amazing volunteers for coming out. On Wednesday, Councilman Mark Gjonaj recorded a fire safety PSA for his constituents. Assemblyman Richard N. Gottfried organized an emergency preparedness presentation for the NYS Assembly. On the same day, we held a Missing Maps event for our youth volunteers to help map unmapped communities around the world for humanitarian organizations to better meet the needs of the most vulnerable. Wednesday afternoon, ABC7 reported that Red Cross responders aided the residents displaced by a 4-alarm fire that tore through a 7-story building in Manhattan. On Tuesday, the Long Island Red Cross held a Mass Care Workshop at the Brentwood Public Library to learn the ins and outs of providing food during a large disaster. On Monday morning, we hosted a training session on the Fundamental Principles of the Red Cross and Red Crescent Movement at our headquarters. Thank you to all who attended. And special thanks to International Services Department’s volunteer, Steven Houser, for facilitating the discussion. The same morning, the Red Cross on Long Island opened a reception center for residents evacuated due to a police incident in Westbury. News 12 reported that Red Cross volunteers assisted six families displaced by a 3-alarm fire in Wakefield. 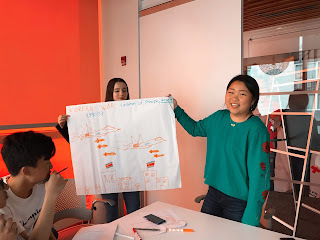 About a week ago, our Chapter Youth Council hosted a very successful Raid Cross: a role-playing simulation activity that helps students understand the basic rules of International Humanitarian Law (IHL). Feb 26, 27, & Mar 1, 3: Red Cross blood drives will take place from 2 to 7 p.m. at the Greater NY Red Cross building located at 520 West 49th Street, Manhattan. Schedule an appointment to donate today! Mar 2: Want to become one of our amazing volunteers? We are hosting an Open House event with free trainings and fun activities. Join us from 11:00 a.m. to 2:00 p.m. in our NYC headquarters. Mar 2: A Citizen’s Preparedness Corps Training will be held in Little Neck where New Yorkers can be prepared for both natural and man-made disaster. The two-hour training sessions will be facilitated by the National Guard, as well as American Red Cross volunteers who have worked with the Division of Homeland Security and Emergency Services’ Office of Emergency Management and Office of Fire Prevention and Control. Visit prepare.ny.gov to sign up. Mar 16: Learn about the mission and vision of the American Red Cross and the many volunteer opportunities that are available for you on Long Island. Join us in our Mineola office from 10:30 a.m. to 12:00 p.m. to learn more! Pillowcase Project Presenters brought emergency preparedness education to the Big Apple Academy. Over the last 7 days, the Greater New York Red Cross provided emergency assistance to 142 adults and 41 children following 46 local disasters. Here are some highlights from last week and a preview of upcoming activities (see below). Late last month, our CEO, Josh Lockwood, sat down with New York State Senator Joe Addabbo for his Legislative Report TV program to discuss the mission, daily work, successes and challenges of the Greater New York Red Cross. On our blog, we shared the story of Cassandra Philip who awoke, last November, to the site of flames and smoke in her Crown Heights home of 15 years. The Queens Chronicle published an article featuring our Queens Disaster Program Manager, Gary Chin, and his tenacious efforts over the last five weeks to promote our Sound the Alarm campaign during a recent spike in home fires. On Thursday, volunteers and staff members at our Long Island Chapter held a Mass Care tabletop simulation of a mass-casualty incident. Early morning on the same day, lohud.com reported that a retaining wall collapsed in a Yonkers apartment forcing residents from their homes. Red Cross volunteers provided emergency assistance to two families who needed a place to stay. The Community Development Corp of LI (CDCLI) kicked off their fire safety partnership with us in Nassau and Suffolk Counties. Continuing with our ongoing #MyRedCrossLife Instagram series: last week we featured Vanessa Greco, the recipient of our 2018 Service to the Armed Forces Award. Vanessa shared her philosophy on volunteerism. 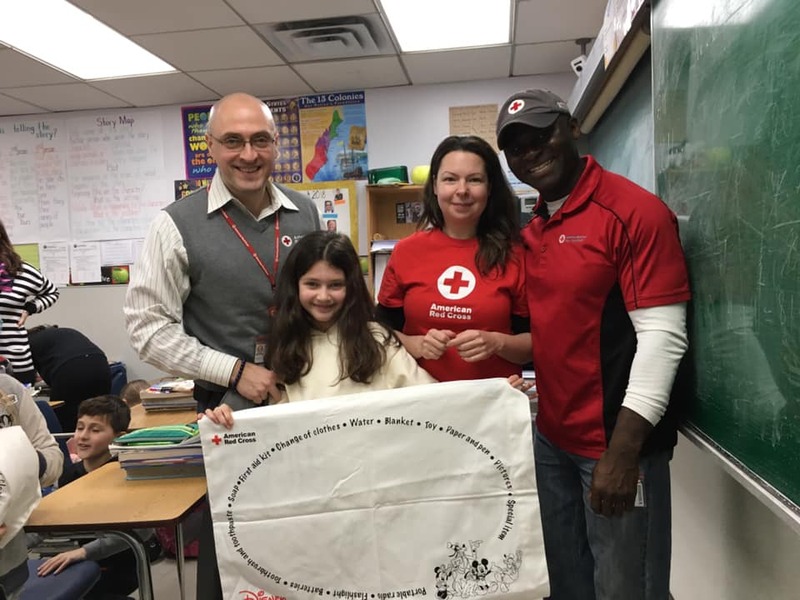 On Monday at the Big Apple Academy, the Red Cross delivered our Emergency Preparedness program for kids, the “Pillowcase Project”, to their 3rd, 4th and 5th graders! Feb 19, 22, 23, 25: Red Cross blood drives will take place from 2 to 7 p.m. at the Greater NY Red Cross building located at 520 West 49th Street, Manhattan. Schedule an appointment to donate today! Feb 19: Learn about the mission and vision of the American Red Cross and the many volunteer opportunities that are available for you in Westchester County and beyond. Join us at our Hawthorne, NY office from 6:30 to 8:00 p.m. to learn more! Mar 2: Want to become one of our amazing volunteers? We are hosting an Open House event with free trainings and fun activities. Join us from 10:00 a.m. to 2:00 p.m. in our NYC headquarters. Mar 16: Learn about the mission and vision of the American Red Cross and the many volunteer opportunities that are available for you on Long Island. Join us in our LI office in Mineola, NY, from 10:30 a.m. to 12:00 p.m. to learn more! On February 13, 2019, Community Development Corporation of Long Island (CDCLI) kicked off its partnership with the American Red Cross on Long Island to make homes safer in Nassau and Suffolk Counties. CDCLI received training to carry out the Red Cross Sound the Alarm program, which installs free smoke alarms and provides fire safety education in at-risk communities across Long Island and across the country. CDCLI, a regional non-profit organization, was founded in 1969 by government, business, and civic leaders on Long Island who came together to address the growing demand for affordable housing. As part of its suite of services, CDCLI offers is the Weatherization Assistance Program, which is a free program provided to low-income Long Islanders, especially the elderly and disabled, to make their homes more energy efficient. As part of this new partnership, CDCLI staff will install Red Cross smoke detectors in each home that they weatherize moving forward, potentially helping to make hundreds of families safer every year. The Red Cross responds to approximately 62,000 disasters per year, including more than 200 across Long Island. Most of these local disasters are home fires. Working smoke alarms in a home cut the risk of death by half, and having an escape plan further improves the odds of survival. The Red Cross wants to end these tragedies and save lives, the reason for launching this fire safety campaign in 2014. Across the country, the campaign is making a difference. As of early February, the Red Cross and their partners across the country have saved more than 500 lives and installed more than one 1.5 million free smoke alarms. Sound the Alarm is a year-round program available to all. To sign up for a free smoke alarm, to join as a volunteer, or to provide financial support, visit www.SoundtheAlarm.org/li. About the American Red Cross The American Red Cross shelters, feeds and provides emotional support to victims of disasters; supplies about 40 percent of the nation's blood; teaches skills that save lives; provides international humanitarian aid; and supports military members and their families. The Red Cross is a not-for-profit organization that depends on volunteers and the generosity of the American public to perform its mission. For more information, please visit redcross.org/li or visit us on Twitter at @LIRedCross. "Three Questions …” is an American Red Cross in Greater New York blog series featuring staff, volunteers, and partners who help carry out our humanitarian mission. Through these short interviews, we hope to shine a light on our different programs and get to know those who make this work possible. For this latest installment of “Three Questions…”, instead of highlighting a member of the Red Cross, we are featuring a recipient of our services. Last November, Cassandra Philip and her 20-year-old son Jaquan lost their Crown Heights (Brooklyn) home of 15 years to a fire. We recently met up with Cassandra to discuss the fire, their recovery and those who helped them get back on their feet. What happened the night of November 7, 2018? My son and I were at home asleep and I smelled smoke. I smelled smoke and I thought maybe he [son] was burning toast. I didn’t wake myself. But then I heard a voice that said, ‘open your eyes'. When I opened my eyes, the television was on fire, the curtains, everything was on fire. I can’t tell you what that voice was cause there was only two of us living there and my son was asleep. I didn’t hear our smoke alarm go off. I would have heard it, it was in close proximity to my bedroom. The fire hit the bed by the time I got up. I tried to throw water on it but it was like I was throwing kerosene on it. The smoke…you see it on TV but you could not believe the black smoke that I saw. My son was up and I was hollering to my neighbors to get out. My son grabbed his phone and keys and called 911. The fire department, thank god for us, is not far. It’s on St. John's and Schenectady. They were there so fast. As I was coming out the front door they were there. What the fire didn’t take, the water did. And to make sure there was nothing in the walls, the fire department had to tear through them. My son’s areas were a little bit more spared than the rest of the apartment. He recovered his dresser. But for me I lost everything. The thing that really hurt me was the picture of my mom and a watch my mom gave me. It's three years now she’s passed away. I can’t get it back. The watch didn’t actually work. The fact that she gave it to me is why I never got rid of it. Sentimental to me, yes, it’s close to me. I went to the hospital. They said I had second degree burns on my foot. I had to have that dressed. And I’m also diabetic. So they were concerned about that. When I got back from the hospital later that morning to meet with the fire marshal, a young man and a lady [from the Red Cross] showed up. They kept saying, ‘I’m so sorry that this has happened to you.’ He even gave me a hug which felt like a million, bazillion dollars to me at that point in time. It comforted me, it allowed me to just take it one step at a time, it told me someone cared. I know I have my son, but this is a complete stranger. Their offer of a few nights at a hotel felt like heaven. I don’t know what heaven feels like but it felt like it. Before I knew about the Red Cross I said to my son, ‘Where are we gonna stay?’ He said we can stay upstairs. I said, ‘What? In a burned-out apartment?’ He said they’ll cover the windows and we would stay where his bed is. I said, ‘OK. I guess so. I’ll get a mask.’ We were going through this in our heads. And when I got to the Red Cross the next day and saw Patrick [caseworker], he went to get shoes, he went to get vouchers for glasses, a debit card so I could buy some things for me and for my son, some clothing. Where are you today with your recovery? It’s still tough but we are comfortable. After the fire I spoke to the super and he said the landlord said to put me in the apartment on the first floor. He didn’t have to do that. Tuesday after the fire we moved back in the building. He’s already given me a lease. The outpouring from everyone, from my church, from friends, from where I work out…they were giving and giving. I had to give away a living room set because two were given to me! Reminds me there’s still good people in the world. Kind people. And when I’m ready, I would like to volunteer because I want to give back that same sort of love and attention, and it is love, that was given to me and my son. NBC News Medical Correspondent John Torres donating blood at our headquarters. Over the last 7 days, the Greater New York Red Cross provided emergency assistance to 237 adults and 98 children following 66 local disasters. Here are some highlights from last week and a preview of upcoming activities (see below). Early Sunday morning, Red Cross volunteers provided temporary housing to dozens of families displaced by a 3-alarm fire in the Bronx. On Saturday, our regional headquarters hosted a Shelter Operation Simulation. Thank you to all the amazing volunteers who participated! 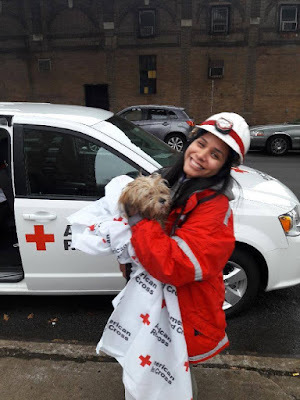 Continuing with our ongoing #MyRedCrossLife Instagram series: last week we featured Red Cross volunteer Lenia Kiki who has been a volunteer since 2017. Throughout the week, elected officials including City Council Members Mark Gjonaj and New York State Senator Anna Kaplan voiced their support for our Sound the Alarm campaign. During the Polar Vortex, we provided useful tips on how to keep you and your pets safe and warm! On Thursday our CEO Josh Lockwood talked with WPIX about a recent spike in home fires. Tuesday’s edition of the Queens Chronicle reported on a fire safety forum that we took part in co-hosted by New York City Council Members Adrienne Adams and Daneek Miller. Wednesday night, Red Cross volunteers offered temporary housing and assistance to 20 Corona residents left homeless by a 3-alarm fire. Monday night, Red Cross volunteers assisted 16 residents after an apartment fire in Mount Vernon. 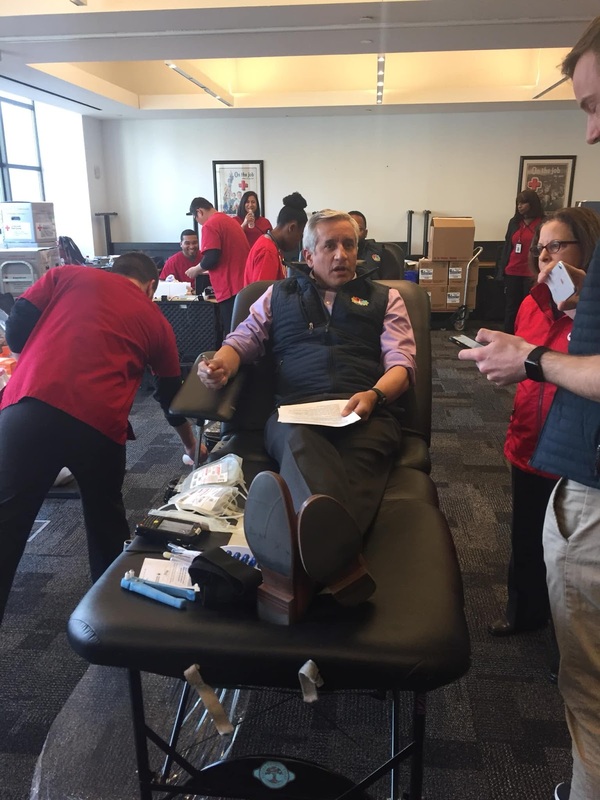 Earlier that morning NBC News Medical Correspondent John Torres donated blood at our headquarters and went live on Facebook. During that time, he chatted about the nationwide blood shortage with Red Cross Executive Medical Officer Kathleen Grima. We are actively recruiting for the following volunteer positions: Volunteer Screener, Home Fire Campaign Team Member, Disaster Action Team Member, Recruitment Support Member, Recovery Caseworker, Mass Care Team Member. Apply today at www.redcross.org/volunteer! For more information, please contact recruitmentgny@redcross.org. Feb 5, 8, 10, 11: Red Cross blood drives will take place from 2 to 7 p.m. at the Greater NY Red Cross building located at 520 West 49th Street, Manhattan. Schedule an appointment to donate today! Feb 9, 10: The American Red Cross is heading to #Long Island on Feb 9 and Brooklyn on Feb 10 to install FREE smoke alarms and provide fire safety information to area residents. Sign up today for your FREE smoke alarm by calling 877-REDCROSS or visiting soundthealarm.org/LI or soundthealarm.org/NYC. Feb 19: Learn about the mission and vision of the American Red Cross and the many volunteer opportunities that are available for you in Westchester County and beyond. Join us in our Hawthrone, NY office from 6:30 to 8:00 p.m. to learn more!